You are currently browsing the tag archive for the ‘Obama’ tag. Never thought I’d see those words in one sentence in a Presidential inaugoration speech – not in my lifetime anyway. Sometimes history moves agonizingly slowly. Other times, it surprises you. So I was in the midwest vacationing and visiting family. I don’t have cable at home, so I wash myself in the cable news when I’m spending any kind of time in a hotel (or rented home with cable). I don’t know why I do it. I’m usually fuming by the time I switch it off. It’s not just Fox News that pisses me off. CNN is actually worse in a way, because you expect them to be journalists along the lines of Walter Cronkite or Dan Rather. The only real news anymore is McNeil-Lehrer, which is deemed “heady” for market standards, but really isn’t much different from the CBS World News Tonight in the Cronkite era. Our standards have just lowered. Yes, there’s a meme out there about the “liberal media establishment,” which basically consists of all media not owned by Murdoch or the Moonies. And the ascent of Fox ratings, along with the push for entertainment format, clearly has the mainstream media grovelling to avoid even the impression of liberal bias. As FAIR has pointed out, right wingers are interviewed on the talking head shows much more frequently than liberals – even on McNeil-Lehrer. So when they are compelled to report that the Swift Boaters are slandering a liberal candidate like John Kerry, they feel obliged to point out the Kerry played with some statistics to make some obscure argument about the economy and report the two occurrences in some equivalent fashion. Or when President Bush, after having referred to his Social Security “reform” package as privatization, then freaked out when his focus groups didn’t like the term, declared that any reporter using the term “privatization” to describe his plan was foregoing objectivity and showing political bias. And the “liberal media” more often than not, caves – the conservatives having played the ref effectively. So it was that last week I was watching a daytime CNN show hosted by a woman named Soledad O’Brien. I think I have the name right anyway. She was reporting on the conflict over the potential sunsetting of the Bush tax cuts. As before, Obama is pushing a bill which will preserve the cuts for 99 percent of the public, and calling for a separate vote on the other two percent. The Republicans are well on message, claiming that Obama is exhibiting political gamesmanship (truth to tell, he is, but that’s really beside the point), and intending to filibuster (if necessary) any bill which does not incorporate the top one percent as well (who would still get the lion’s share of the cuts under Obama’s plan as well). Anyway, the point is that the Republicans are willing to hold the 99 percent hostage in order to preserve the massive cuts for the top. 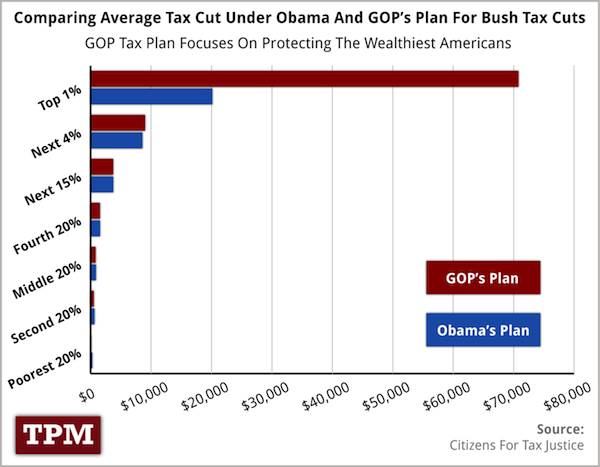 But not only was O’Brien careful to avoid that point, she would not even refer to Obama’s plan as a tax cut plan. She talked about Republicans trying to sell their tax cut plan and Obama trying to sell his “economic message.” That Republicans in voting to kill Obama’s plan are actually essentially voting for a tax increase for the middle class didn’t even come up in explicit terms (I did switch over to Chuck Todd on MSNBC, and he did ask the question, though avoided the “hostage” terminology the liberal wing of the Democratic Party is using – the response from the Republican Governor of New Hampshire was that the Republicans wouldn’t be voting for a tax increase (and thus they wouldn’t be violating their lame oath to Grover Norquist, who will probably give special dispensation as he did with the payroll tax vote) because a few Democrats in the Senate (McCaskill, Tester, and others in tough reelection races) opposed “Obama’s economic plan” as well. But O’Brian wouldn’t touch it. It was Republicans for tax cuts and Democrats opposed, with Obama trying to be cute. She asked some Republican whose name I don’t remember if they would be willing to hold two separate votes, he didn’t give her a straight answer, and she didn’t press. So here’s the graph that tells the story. I think it gets bigger if you double click on it. The mantra is that Obama’s plan impacts small businesses. It does. about three percent of them. Democrats are pressing Romney on the hostage issue, but they should be pressing Republicans in the Senate and House, and their own conservatives. It appears, with regard to the latter, that Reid did just that. The Republicans were calling his bluff and a vote, so they wouldn’t have to filibuster. But it looks like Reid won over a few of the scared conservative Democrats, and now the Republicans are scrambling for a strategy. Looks like they’ll have to filibuster the extension of middle class tax cuts. By the way, the more people learn about “Obamacare,” the more they like it, myself included. So says the recent polling. I’m sure there was plenty of number crunching, and probably he waited until today to avoid being accused of interfering with North Carolina’s insanity, but the discussion is now officially altered. Remember that on the eve of the passage of the Civil Rights Act over eighty percent of the public opposed mixed-race marriage. Sometimes the people lead. Sometimes leaders have to lead. It’ll probably cost Obama a swing state or two, but it puts Romney into a tough spot as to how to respond. He wants to appeal to independents (who don’t see this as a political issue and don’t want it in the national discussion), but he has to worry about the tea party fringe. I’m wondering if it was Lugar’s Waterloo rather than North Carolina which prompted this move. Actually, I suspect it was planned. Biden hinted at it several days ago. Point is, calculated or not, this is a turning point in history. The Log Cabin Club is already freaking out, complaining that it’s a dollar late and a day short. They have a point. But are they going to press Romney on the issue? I doubt it. Second addendum: Romney responds, cautiously. And even more cautiously on domestic unions. And not all progressives are sanguine about the outcome. This blogger thinks that Obama just handed Romney the Presidency. And here’s a TPM article posted yesterday explaining why Obama wouldn’t do what he did today. Third addendum: Barney Frank doesn’t think it’ll cost Obama any votes. This does not meant that the President’s decision today was entirely without some political risk, but I believe it will be clear in the days ahead that this will cost him no votes, since those opposed to legal equality for LGBT people were already inclined to oppose him, and that it will make it easier for us to mobilize the people in this country who oppose discrimination to help reelect him. I disagree slightly. Probably it won’t cost him many votes because while some, particularly in the African-American and Hispanic communities, oppose gay marriage, it isn’t a significant voting issue in Presidential choices. Obama did quite well in 2008 when Prop 8 passed. There was obviously some overlap. Al Franken has some nice words. Fourth addendum: OBAMA FLIP-FLOPS, DECLARES WAR ON MARRIAGE! That was of course a Fox Nation headline. Sixth Addendum: Rush chimes in (after the Fox Nation headline was scrubbed) and a TPM poster responds. ” “We’ve arrived at a point where the President of the United States is going to lead a war on traditional marriage,” Rush Limbaugh said on his show Wednesday.” His first, second, third, and fourth wives could not be reached for comment. Cute line from President Obama as he released his deficit reduction plan. I think in the end, something will be passed with no tax increases, or minimal if there are enough Republican moderates to break away from the Tea Party and buck the Norquist pledge. It depends on how well Obama plays the politics, and it does looking like he’s going for broke. At minimum, he’s learned that you have to start political negotiations with room to move – something he failed to do with health care reform and just about every other fight. I think he’ll get the payroll tax cut extension, despite the Norquist-exempt opposition. And the fact that Republicans are wigging out before they’ve even had time to read the thing suggests that they are concerned that they’re losing the narrative. Of course, whatever passes isn’t going to have a huge impact. It’ll probably stop the hemorrhaging and generate some moderate job growth. But until we find something for high school educated men to do in a post-industrial US, I think we’re going to continue to slide in the long run. Meanwhile, the Wall Street “Occupation” isn’t large, but it’s managing to gather some media attention. I just wish they hadn’t reincarnated the “Days of Rage” meme from the Weathermen. It pretty much marginalizes them. They did get a boost from Roseanne Barr who is running for President. Addendum: Sen. Schumer is demanding that the tax proposal be put on the floor for debate and vote. Democrats are sensing blood here. THIS IS IMPORTANT because Obama may now be facing his own crisis of the Union. Over the last four decades, the Republican Party has transformed from a loyal opposition into an insurrectionary party that flouts the law when it is in the majority and threatens disorder when it is the minority. It is the party of Watergate and Iran-Contra, but also of the government shutdown in 1995 and the impeachment trial of 1999. If there is an earlier American precedent for today’s Republican Party, it is the antebellum Southern Democrats of John Calhoun who threatened to nullify, or disregard, federal legislation they objected to, and who later led the fight to secede from the union over slavery. Read the rest of the uncharacteristic opinion. Maybe he isn’t a leftist anymore. Maybe that’s how goofy the GOP has become. I’m sure you’ve heard by now, Obama released the long form birth certificate this morning, which has a lot of people, including me, wondering about the timing. I personally don’t believe this was intended to resolve the issue. I think Obama actually wants the “distraction,” and he’s feeding fuel to the fire. But I’m cynical. The President directed his counsel to review the legal authority for seeking access to the long-form certificate and to request that the Hawaii State Department of Health make an exception to release a copy of his long form birth certificate, Pfeiffer explained. “They granted that exception in part because of the tremendous volume of requests they had been getting,” he wrote. During the 2008 campaign, the Obama camp released a copy of his birth certificate — the same document that the state of Hawaii would have released to any person born there. But the conspiracy theories continued. Donald isn’t satisfied. He wants Obama’s school records. Newt wants to know why it took so long. No word yet from Rose. The last pre-release poll showed that one-half of Republicans believed that Obama was not born in the US. Unfortunately this poll doesn’t include the numbers who believe he was born in Hawaii, but don’t believe that Hawaii is part of the US. Oh, and if you want to see the forgery itself in pdf, here it is. Driving home from Eureka this afternoon I listened to the speech. At first I listened through KGOE, but the liberal talk show host Karel kept injecting his sarcastic commentary (he is among the portion of the left which opposes the intervention) and it was hard to hear the speech itself. So I switched to one of the right wing stations until I couldn’t get it anymore, and then I realized it would probably be on NPR (quick note – NPR is obviously trying to play for Republican sympathy – two out of the three post-game analysis came from Republicans who said pretty much the same thing). The speech did in fact formally outline the Obama Doctrine – a revival of JFK of sorts. I break the doctrine (as it differs from the Bush doctrine) into three points. 3. Military engagement which is only a subset of the overall policy objectives and not totally ultimate goals based (nuance). This is a very liberal doctrine of interventionism. Basically, Obama deliberated with his advisers, and opted for what the warrior women pushed, and through some remarkable diplomacy obtained the right combo of support and abstentions from other countries (getting Russia and China to abstain at the UN Security Council, getting the Arab League behind it, and the ultimate coup of getting Ankara behind NATO involvement). Yes, Russia and Turkey will trot out obligatory objections, but it’s for constituency cover. Clinton and team put together something no Republican administration could have accomplished. Qater and the United Arab Emirates are participating in the enforcement of UN resolution. There are no mass demonstrations, domestically nor abroad. The left is divided and tentative. So is the right. The concept of humanitarian intervention is revived from the Kennedy doctrine. Since then we’ve always spoken in terms of “vital US interests” and the like. But Obama’s people saw a unique opportunity here to prevent carnage of a city numbered at 700,000 residents, and they got some help from Gaddafy himself who promised “no mercy, no pity” going “house to house, door to door.” It may secretly be about oil or whatever. But the stated objective is the prevention of genocide, and the difficulty opponents have from both left and right is that there is little doubt that the attacks which began a week ago last Saturday prevented a massacre of unthinkable scale. On NPR tonight, the House Armed Services Committee Chair (I think his name is Mike Rogers or Mike Jones – I’ll look it up later) lamented that Obama focused on the humanitarian basis and left out the WMDs in Gaddafy’s arsenal. Go figure! This is an anomaly in that the whole humanitarian military intervention basis sub-doctrine is opposed by many conservatives – not just the isolationist culture-war quasi-libertarian Tea Party folk, but even some of the military industrial complex elite spokespeople who want to emphasize military and economic interests. They don’t like Obama’s frame. They hate it in fact. The confusion in response to Obama’s morally justifiable but probably unconstitutional participation in attacks on the Libya government crosses all political ideologies. So what’s the right wing meme of late? Obama is a sissy who was dragged into war by women. But I like Frank Gaffney’s approach better. Needless to say, I hope the Gaddafi Precedent 1.0 will work out better than seems likely to be the case in Libya. Even more importantly, I am praying that Barack Obama and his anti-Israel troika of female advisors will not take us all down a road that seems ripe for another, ominous application of this precedent, with truly horrific repercussions – for Israel, for the United States and for freedom-loving people elsewhere. A Congress that was effectively sidelined by Team Obama in the current crisis had better engage fully, decisively and quickly if it is to head off such a disastrous reprise. We are of course talking about Hillary Clinton, Susan Rice, and Samantha Power. They reportedly pushed the intervention, with Gates, Brennan, and other male “sissies” in the administration opposed. It’s kind of a mix of criticism – Obama waited too long and had to be shamed by his women, but acted too quickly because women are emotional. It’s right out of the Herbert Dune novel. I was afraid that Obama might pull an “I got the message” Clinton and go all repeal welfare and defense of marriage act on us. He doesn’t appear to be taking that direction. I think he figures that once the benefits of health care reform start kicking in, and once the economy starts improving, he’ll be in a better position in 2012. In any case, he’s invested too much to repeal health care reform and financial reform. In theory the Republicans now have to take responsibility for governing. And while the independents who flip flop back and forth every two years aren’t the brightest lot, I suspect that they will expect more from the Republicans than “no,” and I suspect that the numbers will reveal that they were more essential to the House win than the Tea Partiers. The Republicans have to put up now, and they know it. They were probably hoping for a Clintoneque surrender, and McConnell is already frustrated, accusing Democrats of “taking the wrong message.” It’s not enough for the media to run with the spin. He wants his opposition to believe it too. But his opposition is more leftish now, and the majority of freshmen come from swing districts and are most likely moderates. The next issue is the Bush tax cuts, which expire at the end of the year. Let’s see if deficits remain the paramount issue for Republicans. The pundits all talk about it, and apparently it’s deliberate. They aren’t fighting back comprehensively. The national party orgs are sending money to individual campaigns, and their 537s are financing ads with local issue emphasis. But there is no Democratic Party message, probably because the incumbents who are in trouble are mostly blue dogs and DLCers – conservative Democrats who don’t want a message they can’t sell to Republican-heavy districts. So it came as a surprise to me in an interview with Nancy Pelosi I caught after watching the Giants’ win. She said that one of the best kept secrets is that the private sector jobs created in the first 8 months of 2010 exceed those created during the entire 8 years of Bush rule. That’s a profound statement, which goes to long term liberal narrative that while the modern right wing still emphasizes nationalism in rhetoric it has no problem with sacrificing jobs in the interest of economic internationalism, because while wages are national dividends are international. Keeping jobs in the country is not even in the Republican platform – certainly not prominently anyway. It’s a basic equation. We cannot keep jobs in the country as long as free trade agreements lack standards and force us to compete with near-slave labor. It is frustrating that so many of the very victims of the situation are so caught up in the culture war that they can’t, or won’t, see it. Hence the reddening of West Virginia, once one of the bluest of the union states, who like their governor but don’t want him to be Senator because he shares party membership with the scary Muslim black guy in the White House. The Democrats are going to lose big on Tuesday. Perhaps not as big as the media had been hyping, but big anyway, because they are too timid and lack vision and “audacity” which they can sell to a public suffering the hangover of Reagan’s deregulation, Clinton’s economic globalization, and Bush’s perennial wars. Eugene Goodheart recently wrote about what he sees as the grave political misunderstandings of Obama’s left wing critics, and he raises some excellent points. Yes, there are structural limitations as well as political and cultural limitations to what a president can do. The Democrats represent an amalgam of political and cultural interests, while the Republicans are much more homogeneous. It makes consensus and party discipline much more difficult for Democrats than Republicans. Add to this that the US despite the progress remains a inherently conservative country, ultimately fearful of government intervention at any level unless it takes the form of an invasion of another country or building roads which support at least the illusion of individual freedom of movement. Everything else government offers is suspect, no matter how successful counterpart programs may be in other countries. The basic irony here is that financial crisis makes many Americans more culturally conservative. Keynesianism has saved the economy time and again, used by FDR and Reagan, but it is not credited because there is no long term narrative, probably because such a narrative is culturally difficult to sell. Republicans have been successful in whittling down the economic recovery measures, converting to deficit concern after 8 years of apathy on the issue, and ensuring that any new spending is “paid for” which guarantees that no additional money make its way into the economy. Most Americans forget that the bailout for lenders predated Obama and contained no measures for accountability in how the money would be spent by recipients. And the stimulus package was too little, and too heavy on tax reductions and not enough on labor-intensive multipliers. It was enough to forestall a depression, and generate the largest private sector job growth expansion in a decade, but it did not pull enough people out of unemployment to prevent massive foreclosures and pain. So why don’t we know about it? Obama is the king of the soft-sell. I think he will be reelected in 2012, and maybe given the realities left by Bush and the corporate free-for-all, the mid-term losses were inevitable. Republican critics have blasted the Recovery Act as a failure because it did not hold unemployment below eight percent, as the president’s economic advisers had promised. And liberal economists accused Obama of failing to fight hard enough to enact a bigger stimulus that would have saved more jobs. But since the original stimulus squeaked through, the president has won a series of stand-alone measures — including three extensions of unemployment benefits, the Cash for Clunkers program, a second round of aid for states and a package of loans and tax cuts for small businesses — that have infused another $170 billion into the economy. The Recovery Act itself, meanwhile, has grown from $787 billion to $814 billion, thanks to provisions that were smartly pegged to metrics like unemployment. In fact, should Obama secure passage of two new programs he has proposed — $50 billion in infrastructure spending and $200 billion in tax breaks for investments in new equipment — he will have surpassed the $1 trillion stimulus that many liberal economists believed from the beginning was necessary. “As the need became more obvious to people, we were able to take additional steps to accelerate progress,” Obama senior adviser David Axelrod tells Rolling Stone. The president, in effect, has achieved through patience and pragmatism what he was unlikely to have won through open political warfare. The Republicans know we are at a cross-roads. Their narrative does not specifically address recovery actions except the usual tax breaks which their standard-bearers like Rand Paul argue are the only effective stimulus. But most economists will tell you that tax break stimulus is pretty minimal, and Reagan learned that the hard way in 1981 before pushing a military spending spree in which the deficit grew larger than all previous deficits dating back to George Washington combined, by 1984. It expanded the economy however, and Reagan won in the most lopsided contest in American history, thanks in large part to well-packaged economic liberalism. They know that if recovery takes root and is felt before 2012, the transition towards a European style economy will become inevitable. They are not pledging to put the economy back together in two years. They are pledging to take Obama down. I’ll have more to say about it later, but this is why in this time I won’t be voting Green or other third party, and I won’t be endorsing principled Republicans in any statewide or national office race. The die is cast, and we’re at a crossroads. You can help make the transition easier on Tuesday. Or you can help thwart it by 2012. Really, those are the choices right now.